The EVH Wolfgang has evolved again, this time emerging as a set neck guitar. The visual inspiration is easily recognizable, with the thicker mahogany body (almost 2″) sporting a trans red finish, the sunburst flame maple top, and those top hat knobs. 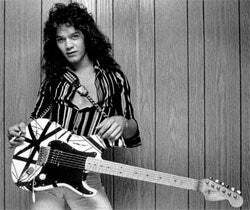 But like all things EVH, the details are what makes it unlike any other guitar. Follow the jump for more specs and pictures. Inside that very slim, fast set neck are carbon reinforcement rods that extend into the headstock to virtually eliminate the possibility of the headstock being broken. Ed went through a few bridge options but settled on the Graph Tech Tune-O-Matic bridge with Schaller fine tuners to keep everything tuned up. Other features include low friction volume pots alongside high friction tone pots, stainless steel frets, and EVH humbuckers, now available with nickel covers. The Music Zoo will have these available as soon as they ship.